Can anyone confirm whether the maps and so on have been included in the reprint? Is it still in 3 volumes? Is this the same edition for sale at http://www.naval-military-press.com also for £48? Yes (but not in fold-out format), yes and....yes! Thank you Phil and Dave. Even if the men we are researching aren't mentioned by name it will be interesting to find out what their units were doing on particular dates. I posted about my Great Grandfather Henry McKibbin (18063) a while back and Promenade told me that "he enlisted in Liverpool in 4 KLR on 1/9/14 and that he was posted to France 4/3/15 with his Battalion". At that time I didn't know much about the man but since then have found him on the 1901 census and downloaded his MIC. I will start a thread in the "Soldiers" forum with a little more info soon. I could definitely do with some help interpreting the MIC, and any information on the 4th KLR at Le Transloy around 28/10/16. My partner's grandfather was Lawrence McEvoy and apparently in the 5th Battalion, we have his MIC - again I'll probably start a thread at some point, we have a picture of this man in France. Its a shame the War Diaries aren't all transcribed and available to buy, I guess there isn't enough demand considering the effort that would entail. Dull. Heavy shelling of Reserve & Front lines – 2nd LIEUT. C. D. REES wounded. Heavy rain in afternoon. 3 O.R. killed & 2 wounded. Fine – Shelling heavy – Saw British Aeroplane brought down by enemy machines – 15 O.R. wounded & 3 killed. Fine & dull. 5:00 a.m. Heavy bombardment & enemy barrage – Heavy rain evening – C.O. & Coy Commanders of 2nd A & S H to see trenches – 8 men killed & 2 wounded. Fine – Battalion attacked DEWDROP TRENCH. Zero 6:00 a.m. A & C Coys in front line in 4 waves. D Coy in support in 2 lines. B Coy carrying Company for stores – 10:00 a.m. LIEUT. PATEY O.C. A. Coy reported DEWDROP TRENCH captured. 2nd LIEUT. CORBRIDGE in charge of bombing party for dug-outs in JUNKON ROAD. 5:00 p.m. trench consolidated. 2nd LIEUT. J. STEWART killed, CAPT. J. C. P. O’BRIEN & 2nd LIEUT. F. R. MILLIGAN wounded, 60 O.R. killed & wounded. 5:00 a.m. Relief by 2nd A & S H complete. Battalion moved temporarily to TRONES WOOD for breakfast & moved on to huts at CARNOY at 11:00 a.m. arriving 12:30 p.m. 2nd LIEUT. R. H. N. MURDOCH, 2nd LIEUT. E. BAILEY, 2nd LIEUT. S. T. EATON-JONES missing. Wet. Huts at CARNOY. General cleaning up. I'll get back to you about the 12th Battalion (William McDonald) as and when I catch up with it. Interesting to see Le Transloy misspelled. We currently live in Sheffield but both have family still in Liverpool, definitely interested in the Family History day and I've been planning on visiting the Museum of Liverpool Life soon anyway. We can schedule it in with one of our regular trips to see the parents. You don't know when the event is do you? The family day is planned for the 16th April at the Museum of Liverpool Life. You have to book a place so you best write to the address I gave you and see if they can book you in. It sounds like your Great Grandfather was part of the bombing party on JUNKON ROAD someone on the forum might have a trench map if you are lucky. Re: Books etc etc. I've finally worked out what I meant. There are plans to do something with the transcribed version of the 4th K.L.R. diary but things still have to be sorted out. Interests:From Flanders to the Somme. Date of death given is 25/08/1918 and commemorated on the Vis-en- Artois memorial. 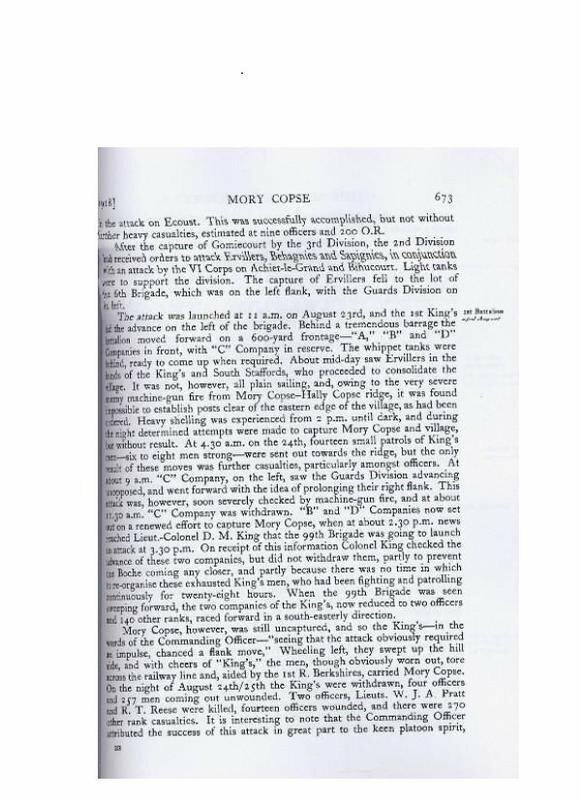 I think that they were in the vicinity of Ervillers, attacking Mory Copse. I should be able to check this later tonight. This forum and it's members are a excellent example of what can be done between people, the greater majority who have never met one another. again thanks for the assistance !!!! Many thanks for your help AGWR, I can't tell you how relieved I am to find out this information. It now means I can stop scratching my head in my ignorance and therefore stop getting splinters in my fingers !!!! Very many thanks for your invaluable contribution to my researches. Hello Dave... Sounds too expensive a proposition for me ! Can you see where the 4th Bat was on 19th May 1915, as my grandad Charles Henry (9998) died on that date? I've imagined it was Festubert. I think at least one of his cousins also died there but I haven't figured out who just yet. They were Cookes. You're correct. It was the Festubert area. They were holding the line between "R3" and "R5" under heavy shell fire. so far so good Dave ! I'm researching my family and would love to get any info on the following men if possible. Any suggestions as to how I would go about finding the info myself also greatly appreciated as I don't know much about this area. Take a look at the mother-site to this forum ("The Long,Long Trail"). You'll find as much information as you need to get you started on there. Could I please request a look up? It's a bit of a long shot, but is there any mention of 29955 Sjt William Fraser. He won the DCM and Bar and MM and Bar, while serving with the 1st Battalion. is there any mention of 29955 Sjt William Fraser. He won the DCM and Bar and MM and Bar, while serving with the 1st Battalion. Not in the index, there isn't. However, the index only lists officers and VC winners. There is a pretty high chance that he's mentioned in the narrative somewhere though. I don't know if I am in the right section but... I'll give it a try!! My Granddad came home from WW1 to be killed in the May Blitz in Liverpool (he's mentioned as Civilian Dead in CWGC) I don't know his battalion! His medal card is here! Interests:Very keenly interested in the Liverpool Pals - during and after the Great War. Also research men from the Aintree district of Liverpool who fought in WWI or II. Any medals etc named to TATTERSALL or any to the 1st Royal IrishRifles. I have a copy of newspaper photo of Pte A.W.Collinson. If you don't have one let me know and i'll email it to you. James William Howarth enlisted in 4 KLR as No 49428 on 4/1/15 and subsequently also served with 17 KLR and 2/7 KLR before being discharged from the Army on 4/4/19 aged 36. He would have received the BW and Victory medals together with Silver War Badge No 495734. Do you have a photo of him that you would be willing to share? Theres a photo of him in his uniform with my Grandma! are you doing Kings Liverpool Regiment? PS If by any chance you can tell me anything else I would love to hear it!! Can I ask how I find out why my Granddad got the siver War Badge ? would that be something in the War Diary? It wouldn't be recorded in the War Diary, it will be listed in the Silver War Badge Rolls at the National Archives, Kew. The reason is usually only abbreviated to which paragraph of the King's Regulations he was discharged under and in the majority of cases it is noted as either (s) sickness, or (w) wounds.